Play with this interactive Wave and Go Puppy and he will be your friend forever. Pat him on his back and wave your hand in front of him to activate his play features and make him walk. He makes real life barking and panting sounds. 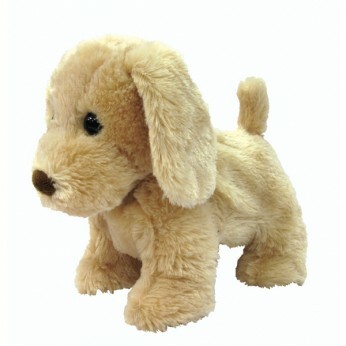 The Wave and Go Puppy packs tons of movement and sounds that you will think he is a real puppy. Batteries included…. This toy costs approximately £19.99 (for the latest and best prices make sure you check our retailer list for the Wave and Go Puppy above). In our review of Wave and Go Puppy we classed it as being suitable for ages 3 years, 4 years, 5 years but recommend you check the manufacturer specific advice before purchasing.